Optimise research data flows and processes by integrating Worktribe with existing systems. Introduce efficiencies and significantly reduce the quantity of manual processes, freeing up administrators’ time to spend on value added activities. Improve data integrity and visibility of research applications, project finances and management information. Support an increasingly complex and changing portfolio of research across the university. The University of York is a research-intensive institution with an annual research income of over £70m and 30 academic departments and research centres. With a new research strategy coming into action in 2015 and the additional motivation of the University’s legacy research costing tool moving into “end of life”, it was the perfect timing for the University of York to pursue a more integrated research management system. Project Sygma was born. A number of stakeholder workshops allowed the project team to identify key requirements including a robust fEC costing tool, configurable workflows and approvals, post-award budget management features and most importantly, the ability to integrate with their existing systems including Agresso (the University’s finance system). Worktribe won the tender to provide the University of York with a new platform that would “change their research grants management universe”. The University of York selected Worktribe’s Pre-award and Post-award products, and the implementation and testing phase commenced in 2016. Critical to the University of York’s research operations was the ability to integrate their new system with a number of existing core systems including Agresso (finance) ResourceLink (human resources). Worktribe’s RESTful API meant that the project team at the University of York were able to take full control of how Worktribe shares data with their existing systems, creating an impressive portfolio of integrations. “There were over 120,000 integration events in the first year that we were live – so each one of those is an instance where someone would have had to respond to something that had happened in the research system and copy it in somewhere. It could have been a few fields or an entire project. We’ve already saved an awful lot of manual effort.” – David Barrett, Research Systems Manager, University of York. 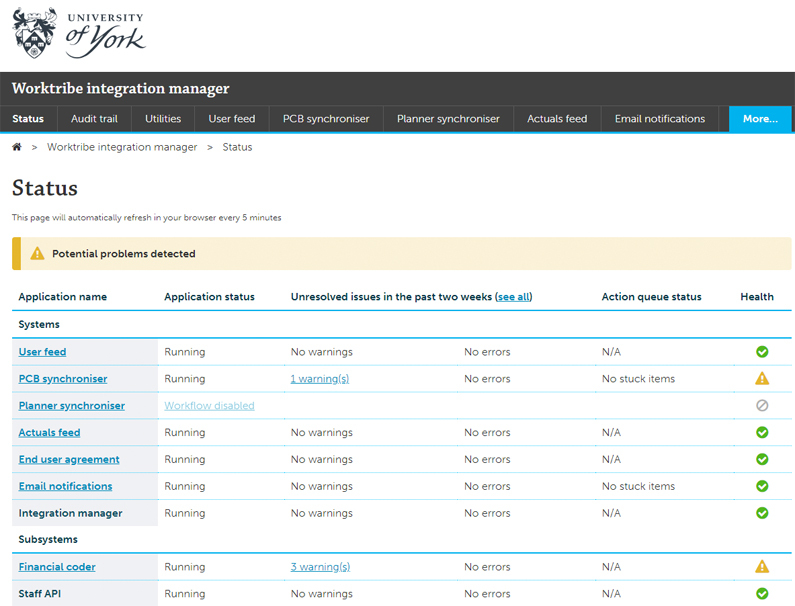 The University of York has also developed its own ‘Integration Manager’ (shown below), with a portal on their website that allows administrators to view the status of integrations and detailed logs, turn them on and off, run feeds and manage queues. Worktribe’s Pre-award and Post-award products are now live at the University of York, transforming how the institution manages research through its lifecycle and supporting an increasingly complex and changing portfolio of research across the university. Worktribe has brought some obvious efficiencies such as less manual entry and double entry of data, improvement of data integrity, elimination of paper based approval routes, saving time and freeing up research administrators to add more value elsewhere. Implementing Worktribe has required the University of York to analyse and re-shape its research data management processes and flows – something that is already providing a foundation for better data integrity. We’ve got better data integrity, we’ve identified a source of truth – that really helps people who are constructing reports to understand where our data is coming from.” – David Barrett, Research Systems Manager, University of York. 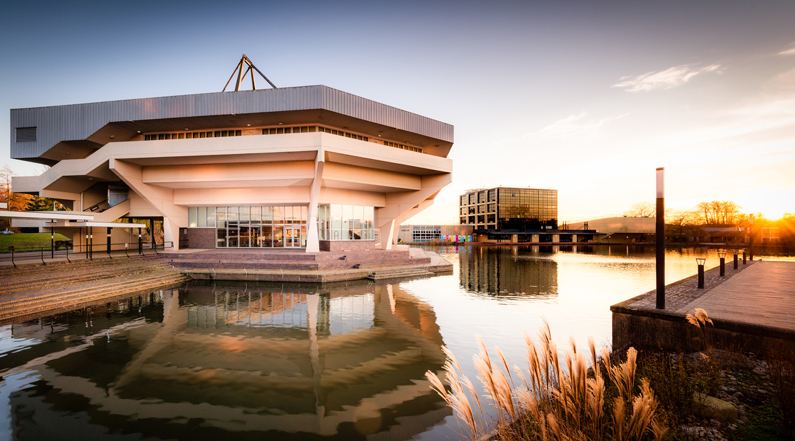 The University of York are in the process of adding more integrations to their impressive portfolio, including a trial project to connect Worktribe’s data extract to Amazon AWS and create MI reports using Amazon QuickSight. The university also intends to extend their use of the Worktribe’s costing tool to include the costing and approval non-research related activities such as consultancy.